After a great start to the season at the Chirk Sprint 2 weeks earlier, next up was Majorca Ironman 70.3. I have picked two 70.3 races through the season, this one in Majorca and the Germany 70.3 in August, which is also the European Champs, to really test myself against some of the best age group athletes. The Majorca race was based in Alcudia, which is a mecca for cyclists during the winter months and a place I have been to a number of times on training camps. This would be the 3rd time the race would take place and has become very popular, filling up way in advance with over 3300 taking part. It has the perfect setting right on the beach, a tough bike course that goes into the mountains on the north of the island and then a fast 3 lap flat run course. Best of all, the weather was forecast for warm sunny conditions of about 23 degrees, which is a long way from anything we’ve had in the UK so far this year, so there was no worry as to whether the swim would hit the magical ‘legal’ 11 degrees or not to allow it to happen! With the field being so big, we went off in age group waves approximately 10-15 mins apart starting with the pros at 8am, then all women at 8.10, Men 18-29 at 8.20 then the 30-34’s at 8.30 and so on. My age group, the 30-34’s had 450 in it. The sea was almost completely calm and the swim was a 1 lap course, out for approx. 800m, 100m across then 800m back to the beach. I swam solidly throughout and was out of the water in 25:30, in 4th place. We had about a 400m run up to transition, a quick change and on to the bike via a 500m long transition area, it was massive! The bike course started with about 20k of flat road out towards Pollensa, then headed inland towards the mountains. The road started to go up at about 2-3% for approximately 7km and then became 7% for another 7k to the top, before about 5k of undulation where we hit a village called Lluc. Then there was a spectacular descent with numerous hairpin bends down into the town of Inca and then it was pretty flat all the way back to Alcudia. I thought it may be interesting to add in my Power Chart from the ride which gives a feel for anyone interested in what is needed for a ‘somewhere near the top end of age group racing’. Racing weight is obviously important so I am 74kg and threshold is 330 watts. * The first 30 mins is predominantly on the flat and I’m up at 294w travelling at approx. 38kmh, so have started reasonably strongly, but not over the top and a way off my threshold for 1 hour. * The long descent last just over 15 mins with coasting and sprinting out of the corners. Unfortunately I hit a bump and knock my speed sensor down my spoke so that’s the last I see of speed or distance. 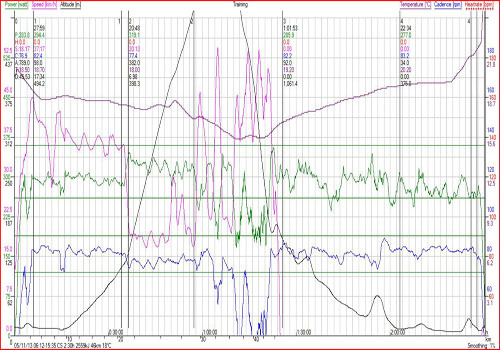 * Overall power is 284w, bike split 2:30:01 for 90k. 9th fastest in age group. Position wise, it became difficult to see how I was doing as I started catching the waves in front. Early on in the bike, a couple of strong cyclists came past me and posted very quick bike times, but then I didn’t see many after that, so suspected that I was in about 8th after the bike. 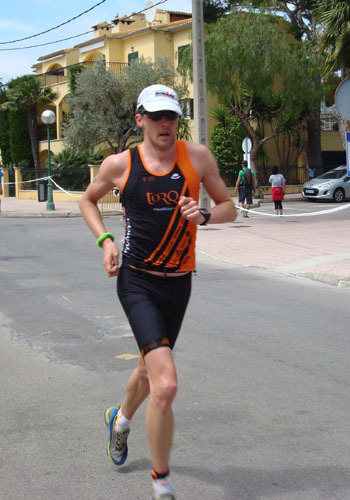 Nutrition wise I took 2 x 750ml of Torq Energy Orange with 4 x Torq Gels – 1 every 30 mins. Note: This article is based on Chris’ ability and requirements and does not constitute unique advice. If you require help with training or nutrition you should consult with TORQ direct (JE). In the past I have worked to about a 1:24 half marathon off the bike (6:30/mile), but have trained hard on my running over the winter and knocked over 2 mins off my recent half marathon times, so I was hopeful of running under 1:22. I had finished the bike strongly and seemed to settle into 6:10/mile running reasonably easy. The sun had come out and it was pretty warm, so I was keen to keep taking on fluids and pouring water over me at each aid station. I topped myself up with 2 x TORQ Gels at 25 mins and 50 mins .With ½ ironmans the run seems to start reasonably easy and 8-9 miles is the point where you really start to feel it. If you have got the pacing right, your pace doesn’t slow very much, it just gets harder. Get it wrong and you can lose 2-3 mins in the last 3 miles. I seemed to get it just about right on this occasion. It was at the 10 mile point where my body wanted me to slow down, but with only 3 miles left I wasn’t going to give in. My final run time was 1:21:44 for an overall time of 4:23:05. It had been hard to keep a tab on places, but looks like I overtook 3 people in the closing stages to finish 5th in the 30-34 age group. Overall I am very happy with the result – you always come away from a race like that and look at ways you think you can knock time off. This was a well-paced race and is definitely a step on from previous ½ ironmans with my highest average bike power and quickest half marathon by 2 mins. When I go to Germany in August for the European 70.3 Champs, I will hopefully be a bit fitter, and take a couple more risks. In the meantime, I know have to concentrate on qualifying for the World Olympic Distance Champs in London at my local race in Chester, then Bala Middle Distance the week after.